"She just doesn't understand my work. She never lets me talk about murder at the dinner table." Agatha Christie is arguably the greatest mystery writer not only of her time, but of all time. One of her most endearing characters is inspector Hercule Poirot. The impeccably dressed Belgian with the handlebar mustache and walking stick is a most unlikely sleuth. A bit like Columbo, he appears to stumble through his investigation, giving those around him, including the guilty parties, an impression that belies his true genious. This box set from A & E gives us two episodes, The Murder of Roger Ackroyd and Lord Edgeware Dies. 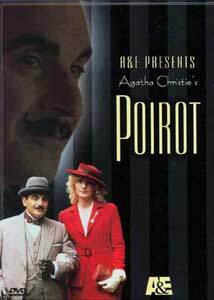 These are the third and fourth Poirot episodes to be released to dvd, the first two being Death in the Clouds and The ABC Murders, both released separately earlier this year by a different studio. Without giving too much of the plots away, here is a brief synopsis of the two episodes in this set. In The Murder of Roger Ackroyd, a retired Poirot struggles with gardening until a friend of his, tycoon Roger Ackroyd, is found murdered. Poirot puts his retirement on hold to investigate his friend's murder. Poirot has decided to return to his investigative ways in Lord Edgeware Dies. Shortly after the wife of Lord Edgeware gets Poirot to help her convince her husband to grant her a divorce, Lord Edgeware turns up dead. Lady Edgeware is obviously the main suspect, although she has an airtight alibi, or does she? It seems that many people wanted the Lord dead, and one of them has set out to frame Lady Edgeware, or have they? Only Poirot knows. Each episode runs 100 minutes in length. All of the supporting characters are introduced quite nicely, but assumptions are made that the viewer is already familiar with Miss Lemon, Captain Hastings and Chief Inspector Japp. Suchet is, as always, wonderful as Poirot. The only negative I could think of as far as the stories themselves go is that they seem to play out just a little slow. This may be necessary to the mystery genre, but I just feel that it makes the shows drag unnecessarily. Other than that, I really cannot find fault with these shows. Image Transfer Review: The picture on these two discs was quite good considering the source. Colors were a bit muted in some places and there was a bit of edge enhancement and graininess. Most of the scenes take place indoors and are not very well lit, but this was not a problem. Fleshtones and blacks seemed very good. Overall, however, I was quite impressed. Audio Transfer Review: The audio on these discs was alright, but not great. Dialogue is anchored quite heavily to the center, with very little directionality at all. Dialogue was intelligible, but just slightly muddied. The score sounded quite nice, never overpowering the actors voices. The lack of any surround activity, however, is not missed on a show such as this. Extras Review: There are seriously no extras to review on this disc. There is a one minute A&E Mysteries commercial that runs prior to each episode which was a bit annoying. Also, there are no subtitles, which are sorely missed as I sometimes have trouble understanding the British accents. I will say that the packaging was quite nice. Two keepcases that fit nicely into a cardboard slipcase. Quite simply put, if you are a fan of either Poirot, Christie, or mysteries in general, you will most likely enjoy this set. (If not, then you probably didn't even bother reading this review.) The only major drawback that I could see from a DVD point of view would be the lack of any extras at all. On the other hand, the audio and video are more than sufficient and both stories play out quite nicely. I look forward to more of these episodes being released in the near future.